Barcelona queen bed tiger mahogany. Barcelona queen bed dark brown mahogany. Barcelona king storage bed tiger mahogany. Barcelona king storage bed dark brown mahogany. Barcelona bed detail headboard heights. Barcelona bed detail tiger headboard. Barcelona bed detail dark brown headboard. Barcelona king tall bed tiger mahogany. Barcelona bed detail storage drawer. 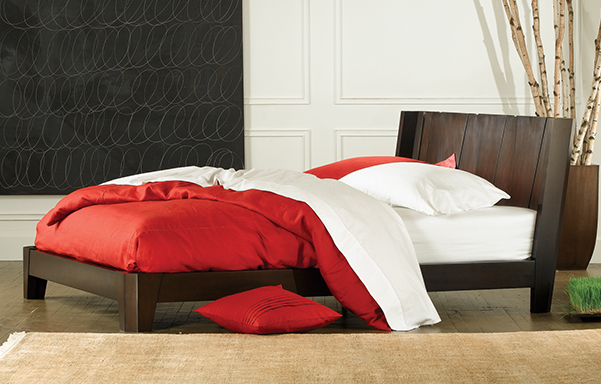 Our Barcelona platform bed captures the spirit and drama of late 20th century design with a variety of subtle details. Entirely handcrafted of solid, plantation grown Mahogany. Standard or tall headboard to accomodate mattress heights. Beautifully hand finished. Deck height from floor 12-1/8"